In the present, provisional inventory, World subterranean stygobitic fresh and anchihaline water species, as well as stygophilic species from land crab burrows, prawn culture fields and interstitial coastal belts are listed. Species described before 1994 according to Pesce, Juberthie-Jupeau & Passelaigue (1994) review. Definition of "subterranean" taxa, geonemy and ecology after Botosaneanu - Stygofauna Mundi (1986). Limited or particular geonemies are detailed. For some taxa, marked with "+", more information is given on their systematics, ecology and geonemy, and publication data. Most mysids are fairly small, between 0.39 and 1.18 in (10 and 30 mm) long. They have a shieldlike carapace that covers the cephalon (head region) and most of the thorax. The carapace is fused with the first three (in rare cases the fourth) thoracic somites (segments). The eyes are usually stalked and movable; the cornea is generally developed with visual elements, but tends to be reduced with increasing depth of habitat. The antennules (antenna 1) and antennae (antenna 2) are biramous (forked). Male mysids typically bear a setose (bristly) lobe, the processus masculinus, on the peduncle of the antennules. The thorax has eight pairs of pereopods or thoracic limbs, all of which are divided into two branches, an endopod and an exopod. The endopods of the first and sometimes the second pereopod are usually transformed into gnathopods (specialized appendages for feeding), which differ considerably from the remaining limbs. Female mysids have a marsupium made of fewer than seven pairs of lamellae (oostegites or brood plates), in which the embryos are kept until they grow into juveniles. The abdomen consists of six somites, generally similar in form but with the last somite longer than the others. Each of the first five abdominal segments bears a pair of pleopods. The pleopods are biramous, frequently reduced in the female and sometimes in the male. They are often sexually modified in the male. The telson, or posterior extremity of the body, has a pair of appendages known as uropods, which form a well-developed tail fan. A statocyst, which is a tiny organ related to the animal's sense of balance, is usually present in the endopod of the uropods. Mysids themselves are often glassy or transparent; they can be seen only when the observer notices their black eyes darting about in the water. Most mysids have a body pattern formed by dark star-shaped chromatophores (clusters of pigmented cells) against a light background color. Some species turn dark when placed against a black background; others that are usually light green and found among green algae may change to dark olive. Deep-sea mysids are often red. Mysids are originally marine crustaceans. They are a highly adaptive group, however, which makes them effective invaders of new habitats, including brackish water and freshwater environments. As a whole, the group is essentially pelagic, although commonly epibenthic, which means that they live on or immediately above the surface of the sediment. Some species burrow into the sediment, live just above the sandy or muddy bottom, or migrate between substrates at the bottom and the surface waters. A few are strictly pelagic species; some live in shallow water in the littoral zone among macroalgae, in crevices along rocky shores, or on sandy beaches. Many species of deep-sea mysids are found on or just above the ocean floor at various depths, including abyssal waters at depths of 18,700-23,622 ft (5,700-7,200 m). Most sand-burrowing and coastal mysids perform a diel (24-hour cyclical) vertical migration, rising and dispersing into the water column at night and returning to deeper water towards dawn. Many are benthic by day and pelagic at night. A few species rest on algae during the day or on stones and cliff ledges; only a few mysids bury themselves in sand. Gastrosaccus throws up sand grains by moving its thoracic limbs while lying on the sand. Paramysis digs ditches in muddy sand with its first three pereopods. This species can dig for long periods of time, producing open ditches as long as 1.9-3.9 in (5-10 cm) within an hour. Almost all bathypelagic and bottom-dwelling mysids, even those that burrow in sand, rise in the water column at night. The stimulus for this migration may be light intensity; the time it takes the mysids to rise depends on the speed and depth of water currents. This nocturnal pattern is most noticeable during spawning periods, and may be related to the dispersal of young mysids leaving the marsupium. Littoral species sometimes move to deeper water in fall and return to the shoreline in spring or summer. Some species of mysids form swarms. These swarms may be several miles long and three or more feet in diameter. Mysids are primarily swimmers; all members of the class can swim up, down, forward, and backward. The females have reduced pleopods and swim with the exopod (external branch) of their pereopods. They hold the exopods out to the sides and rotate them so that the tip describes an oval. They move their limbs continuously in a slightly different phase and draw water from the sides toward their upper surface. In this way two strong currents of water, one parallel to the abdomen and the other some distance from it, drive the body forward. Many species hold their bodies in a horizontal position with the dorsum up while swimming. A few hold the anterior part of their bodies in an almost vertical position. Some species swim in schools. School formation among mysids depends on optic signals during the day and probably sensitivity to water currents generated by the swimming movements of their neighbors at night. Mysids that are suddenly disturbed jerk backward by flexing their abdomen and tail fan against their thorax. Bottom dwellers walk slowly on their endopods with their exopods also in constant motion. The eyes and statocysts keep the body horizontal even in the dark. If a mysid is illuminated from the side, it will turn its back toward the light. The angle of turning may be greater than 45° especially if the light is strong. The animal's optic control over body position is able to override the statocysts. Most mysids are filter feeders, removing fine detritus, rotifers, mollusk larvae, diatoms, and other planktonic organisms out of the water while swimming just above the bottom and creating a suspension feeding current. All filter-feeding mysids may also feed raptorially; that is, they may actively capture selected prey from the environment. They have species-specific feeding modes; some species can switch from one feeding mode to another according to food availability. Members of some mysid genera, including Neomysis and Siriella, have been seen to catch small live crustaceans (copepods, cladocerans, amphipods) as well as small mollusks. Mysids use their gnathopods to seize and feed on zooplankton as well as to strain phytoplankton and particulate debris. These appendages move the food under the animal's mandibles (jaws) and press it against these cutting appendages. On the other hand, mysids are the prey of many larger predators around the world, including invertebrates, fishes, birds, seals and whales. Male mysids do not actively search for females during reproduction. After shedding a previous brood, the female soon molts and is ready to breed again. At that time she produces a pheromone, or chemical substance that stimulates the antennules or the antennular processus masculinus of nearby males. Mating is very quick and takes place at night. The male lies under the female either head-to-tail and belly-to-belly, or doubles up and grasps the anterior part of the female's abdomen with his antennae. The sperm are either injected into the female's brood pouch or shed between the mating individuals and swept by currents produced by the thoracic appendages into the marsupium. The copulating pair soon separate, and within half an hour the female's eggs are extruded into her brood chamber and fertilized there. The incubation period and frequency of mating depends on the species and the water temperature, and can range from a few weeks to several months. The young are shed as juveniles with complete sets of appendages. Released mysids need about a month to reach their adult stage at a water temperature of about 68°F (20°C). The IUCN has placed three species, all anchialine stygobitic mysids (Bermudamysis speluncola, Platyops sterreri, and Stygiomysis hydruntina) on its Red List as Critically Endangered and another one as Vulnerable. Regression or even complete extinction of mysid populations as a result of human impact has been documented. Mysids are endangered by domestic and industrial pollution of coastal waters; dredging of canals (for land use, fisheries, and navigation); artificial redirection of waters (for river traffic and dykes); groundwater drainage; and the repeated application of pesticides. Subterranean ecosystems are variously threatened by tourism, agriculture, urbanization, and the construction of hydroelectric reservoirs. 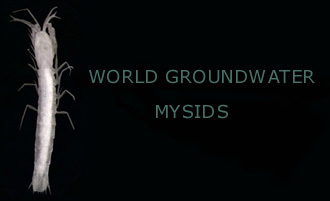 Mysids at present include more than 1000 species, widespread over all the continents, inhabiting coastal and open sea waters, as well as continental fresh waters, several taxa occuring also in different groundwater habitats and in anchialine caves. Among the subterranean mysids, most species are stygobiontes, a few are stygophiles, in this last case, adaptation to groundwater life is limited to reduction of eyes and/or body pigment. Some marine species reported from coastal caves do not exhibit ramarkable adaptation or specialization to the subterranean habitat. 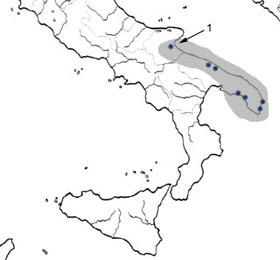 True stygobitic groundwater mysids successfully colonized central America, the Caribbean area and the Mediterranean basin; only three stygophilic species are known outside of these regions, viz. Spelaeomysis longipes and Spelaeomysis cochiensis from India, and Spelaeomysis servatus from Zanzibar and Kenya. A tethyan origin is supposed for the most stygobitic mysids, with some reserve as regard the distribution patterns at specific level. At present, several groundwater taxa, most endemic, are known from coastal, marine caves, phreatic waters (wells) and anchialine habitats, the majority of which colonized the groundwater nets owing to stranding and uplifting of their marine ancestors pending the regressions of the Thetys and the Mediterranean; other taxa are more recent and stygophililes. The genus Spelaeomysis presently includes nine named species, seven from different groundwater habitats (anchialine caves, wells) of South Italy, Zanzibar, Mexico and Cuba, one from prawn culture fields of India , the other one from crab burrows of Colombia. Recently Garcia-Garza et al. (1996), in occasion of the description of S. villalobosi from Mexico, reported a key to the known species, including only seven species and omitting S. bottazzii and S. cochinensis, as well as mispelling S. servatus with S. serratus. * Recently, in the course of speleological research in the ground waters of Gargano, carried out by E. Rossi and S. Inguscio (Gruppo Speleologico Martinese), with the collaboration of the "Gruppo Speleologico Dauno" and the "Speleo Club Sperone" specimens of Spelaomysis bottazzii and Typhlocaris salentina were collected . 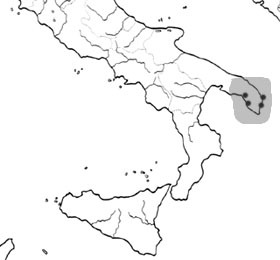 This is the most northern record of these crustaceans in the Puglia region. The family Stygiomysidae includes a single genus, Stygiomysis, and seven described stygobitic species (five anchialine, two freshwater), six of them from the Caribbean, one from South Italy. According to Bowman (1977) the genus Antromysis includes four subgenera, viz. Antromysis s.str., Anophelina Bacescu & Orghidan, 1971, Parvimysis Brattegard, 1969 and Surinamysis Bowman, 1977; the last two subgenera do not include true stygobitic species. The genus Palaumysis was erected by Bacescu & Iliffe (1986) to accomodate mysids from marine caves of Palau (Micronesia) showing peculiar characteristics, such as rudimentary antennal scale (no scale according to the original description), apomorphic anntennal flagellum, strong peraeopods with carpopropodus not divided, and two oostegites in the females. Species of Heteromysis are known from different habitats, only three species have been reported from coastal ground waters(anchialine and submarine caves). A selected World bibliography on subterranean mysids can be found in: Th. E. Bowman (1984). Mysidacea. Stygofauna Mundi: 405-409; Pesce G.L., Juberthie-Jupeau L. & Passelaigue F.(1994). Mysidacea. Encyclopaedia Biospeologica. Societè de Biospéologie, Moulis, Bucarest: 113-119; Bowman, Thomas E., Thomas M. Iliffe, and Jill Yager. 1984. New records of the troglobitic mysid genus Stygiomysis: S. clarkei, new species, from the Caicos Islands, and S. holthuisi (Gordon) from Grand Bahama Island (Crustacea: Mysidacea). Proceedings of the Biological Society of Washington. 97(3):637-644, 4 figures.